Bigasoft Total Video Converter is the best video converter to fast convert between a wide range of video and audio formats.It is the best helper to make people enjoy all video and audio files on any devices like iPod, iPad, iPhone, BlackBerry, Apple TV, Zune, PSP, PS3, Pocket PC, Creative Zen, Xbox, Archos and so on. 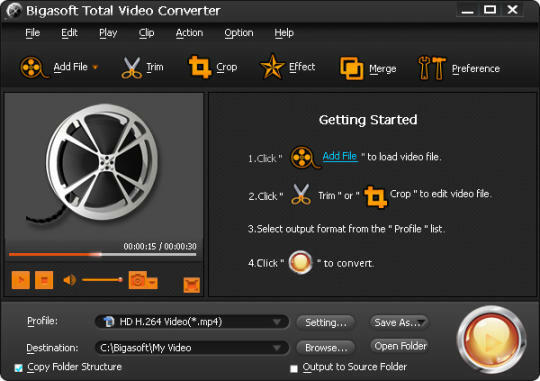 Bigasoft Total Video Converter is more than a video and audio converter. It is also a great video editor. With Bigasoft Total Video Converter, it is so easy to cut, trim, crop, merge, clip videos, add watermark and use many other wonderful effects. Bigasoft Total Video Converter recently updated to support converting videos to Apple iPhone 5, iPad Mini, New iPad 3and more to let you enjoy your favorite and popular videos anywhere. Convert to various formats easily. Convert HD video to different formats.